JICWEBS Alignment - In late January, TAG and the UK’s Joint Industry Committee for Web Standards (JICWEBS) announced plans to align many of their key initiatives to create a consistent approach to challenges facing digital advertising. As part of the alignment, TAG would take responsibility for UK efforts around fraud, malware, and piracy, while JICWEBS would continue to drive brand safety efforts in the UK. By the end of 2018, JICWEBS had merged its anti-fraud programs into TAG’s Certified Against Fraud Program, with broad industry support. TAG European Office Opening – In March, TAG announced the opening of its first non-US office in London and the hiring of an experienced EU policy executive, Nick Stringer, to support its rapidly expanding global presence. Stringer was former Director of Regulatory Affairs at the Internet Advertising Bureau UK (IAB UK) and former Chair of the European Interactive Digital Advertising Alliance (EDAA), and he now serves as TAG’s Vice President of Global Member Engagement and Operations. European Commission MOU Signing – In June, TAG signed a European Commission’s Memorandum of Understanding (MoU) on Online Advertising and Intellectual Property Rights (IPR), the culmination of many years work and discussion between the European Commission, the digital advertising sector and the creative content community. Companies can demonstrate their compliance with the MoU through TAG’s Certified Against Piracy Program, a strong validation of the TAG program’s effectiveness. First Non-US Auditor Named – In August, TAG welcomed ABC, a leading UK digital verification expert, as an outside auditor for the TAG Certified Against Fraud, TAG Certified Against Piracy, and TAG Certified Against Malware Programs. ABC becomes the third independent verification provider – and the first focused on a non-US market – for TAG’s seal programs, joining BPA Worldwide and the Alliance for Audited Media in providing those services. White Paper on Global Standards Released – Kicking off September’s DMEXCO conference in Cologne, Germany, TAG released a White Paper – "Global Standards for Local Markets: A Roadmap for Establishing Global Harmonization in Digital Advertising Standards"– on the need for consistent and scalable global standards to tackle cross-border industry challenges. The paper proposed a global standards framework to meet the needs of national markets – i.e. 'global standards for local markets' – through collaboration with local and regional entities. Turkey Collaboration Launched - At a press event in Istanbul in September, TAG announced a new collaboration to expand its efforts in Turkey in partnership with GÜR, the Turkish platform for Trustworthy Digital Advertising, which was founded by the Advertising Agencies Association, the Advertisers Association, and IAB Turkey. Global Membership Boom – TAG’s non-US membership increased dramatically over the course of the year, ending with more than 100 member companies based outside the US, roughly one-quarter of TAG’s total membership and a 137 percent increase over the prior year. Requiring Ads.txt Adoption – Early last year, TAG announced that its updated guidelines for the TAG Certified Against Fraud Seal would require publishers to adopt and implement the txt specification released by the IAB Tech Lab in 2016. That requirement was one of the key factors in increasing ads.txt adoption by more than 6x over the course of the year, from under 100,000 domains to more than 600,000. Working with Law Enforcement - In August, TAG expanded its ongoing collaborative efforts with law enforcement agencies to fight digital ad crime by signing its first information-sharing contract with the Department of Homeland Security (DHS) for its Cyber Information Sharing and Collaboration Program (CISCP). The agreement will better allow TAG to provide DHS officials with industry intelligence and expertise. Improving Programmatic Advertising - In October, six of the leading advertising exchanges jointly sent a joint letter to TAG outlining principles for a better programmatic marketplace and asked TAG to help review and codify those principles into new standards for certification. The letter included new proposed standards around efficiency, transparency, and fair-market principles that will now go to TAG’s Business Transparency Committee for evaluation, revision, and consideration. Too often, motion does not equal progress, which is why TAG was pleased that an updated 2018 analysis by The 614 Group in November found that TAG’s anti-fraud efforts were having a dramatic – and sustainable – impact in reducing fraud through TAG Certified distribution channels. Further validating the industry’s approach, a December white paper from TAG and BSI found that investment in brand safety initiatives resulted in a positive ROI for some marketers who tracked that cost. The paper was also the first to quantify brand safety investment, finding that large agency holding companies are currently spending between $3-7 million annually on fixed-cost brand safety expenses. By any standard, 2018 was a year of tremendous improvement, interconnection, and collaboration for our industry in addressing the challenges of digital advertising, and TAG is delighted that the success of our efforts can be seen in measurable trends of increased consumer confidence, less waste, better ROI, and reduced criminal activity. With your support, we look forward to continuing that growth and success in the year ahead. 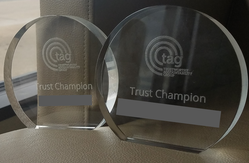 Announcing the Third Annual TAG Trust Champions Every year, TAG recognizes the industry leaders who have made exceptional contributions to the industry’s efforts to advance brand safety with our organization’s highest honor as TAG Trust Champions. This year, those recognitions go to individuals leading TAG efforts at two companies that have been instrumental in TAG’s growth and accomplishments across the spectrum of our activities, from fighting fraud to blocking malware, ending piracy, improving transparency, and raising our industry’s collective standards. The collective leadership of the Dentsu team on the TAG Leadership Council has been a powerful driver of TAG’s success over the last year, while the team’s strategic guidance about how Team TAG can better serve the entire TAG Community has helped to elevate TAG’s work to new heights. OpenX has always had a commitment to increasing trust and transparency throughout the digital advertising supply chain, but in 2018 they doubled down on these efforts across a range of TAG programs. Christopher Hallenbeck oversaw a complete revision of the TAG Inventory Guidelines Program as Chair of the Inventory Quality Working Group, while Dallas Lawrence and John Murphy organized a major effort to increase transparency in the programmatic marketplace. 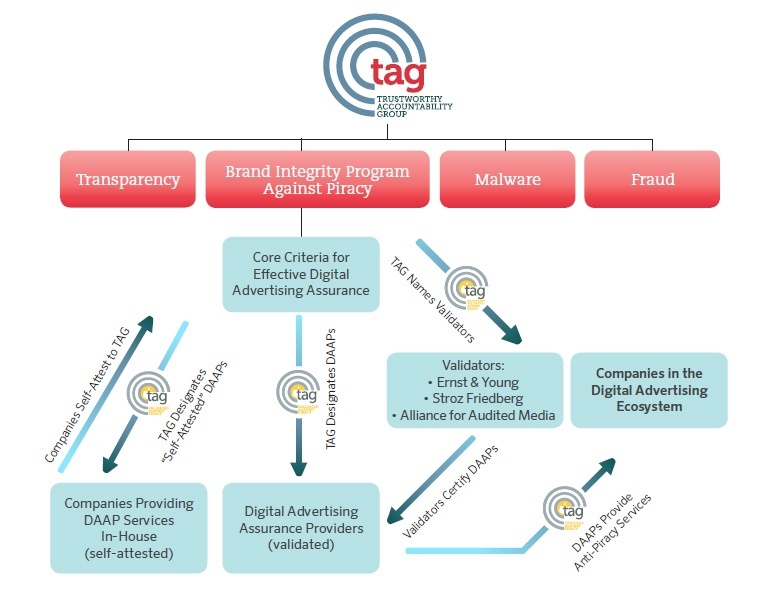 The Principles for a Better Programmatic Marketplace introduced new disclosure requirements across all of TAG’s certifications, which will engender trust and confidence for marketers around programmatic buying. Please join me in thanking our TAG Trust Champions for their extraordinary efforts on behalf of TAG and our programs!